What is the best keyboard vacuum? What is the best vacuum for laptops and PCs? Over time, dust, dirt, and debris settle on your PC. This can result in malfunction of various computer parts such as keyboards. You need to find the best vacuum for computers to be able to keep up. So, what is the best computer vacuum? In this article, we look at the top 4 best vacuums for computers that you can buy this year. We have also included one of the best blowers for computers. Please note that if you have to vacuum the inside of your computer, you must ensure that you use an anti-static computer vacuum. Regular vacuums create static electricity that could damage the electronic parts. (Editor's choice) 2.95 lbs 12 ft.
2. 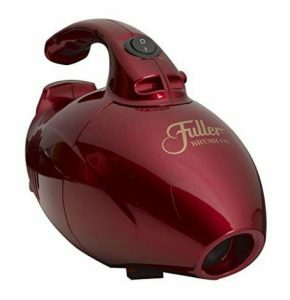 Fuller Brush Mini Maid Handheld Vacuum 3 lbs 15 ft.
(Blower) 2.75 lbs 12 ft. This is a very good vacuum for computers. It also doubles up as a blower. This 2-in-1 functionality helps to save cost. You can either hold it by hand or use a shoulder strap that is provided as part of the package. It is also very light hence should be very easy to carry as you clean your computer. You also get accessories such as a crevice tool, an air pin-pointer, a soft bristle brush, and a 4-piece micro cleaning tool kit. These are essential for a wholesome cleaning of any desktop computer, laptop, printer or keyboard. 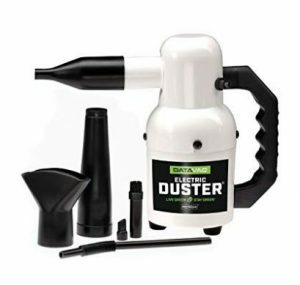 It is also a great alternative to canned air when you want to use it as a blower. This is another vacuum that is good with computers and their accessories. It has enough suction to pick up dust, debris, and hair especially from laptops and keyboards. It has a long power cord that should give you enough reach. Also, you get a few accessories that help you to clean even the desk on which your computer sits. These include an upholstery brush, a dusting brush, a crevice tool, and a flexible hose. It is also easy to empty the dust cup once it reaches the max level. If you are looking for a mini vacuum for your laptop or your desktop’s keyboard, this is another fantastic option. It is cordless and uses a 2000mAh Li-battery to produce a relatively strong, fade-free suction. It comes with 2 nozzles that help to pick up dust, hair, crumbs, or scraps hiding in between keys. This handheld cleaner is quite small but effective in its task. The size makes it convenient to use given that you are also cleaning a relatively small surface. This is another hand vacuum for keyboards and laptops. It has enough suction to get rid of dust and debris on the keyboard. Also, you get 3 nozzles for versatility. These include a brush nozzle, a flat nozzle, and a tube nozzle that handles granular stuff. After 4 to 5 hours of charging, you can use it for quite some time before the charge runs out. Also, it has two air outlets on either side. This increases the rate at which heat is dispersed, making it more durable. As mentioned at the start of the article, regular vacuum cleaners generate static electricity that may harm your machine. It is, therefore, not recommended to clean the inside of your computer using such vacuums. If you don’t have an anti-static vacuum, you should use a blower instead. So, what’s the best blower for computers? We recommend the Metro Vacuum ED500P based on its effectiveness in getting rid of dust and debris from computers and their peripherals. It is among the best alternatives to canned air based on its effectiveness and safety standards. It is also more economical. A body of steel makes it long lasting. Also, it comes with a few accessories to make your work easier. These include an air concentrator nozzle, an air pin-pointer, an air-flare nozzle and a micro-cleaning tool kit for tight spaces. In general, vacuums are either corded or cordless. The same is applicable to computer vacuums. Each option has its own merits and demerits, and you should buy the one which you feel comfortable with. Whereas cordless vacuums are convenient, you only get so much battery charge. On the other hand, corded vacuums can limit you if the cord is too short. However, they are usually more powerful and can be used for long periods without the worry of recharging. 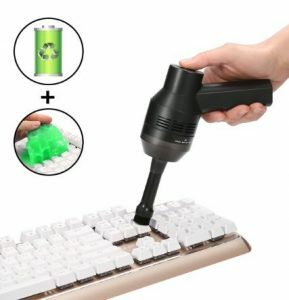 If you are going to clean the entire computer effectively, you need an array of accessories to make your work easier. So, a vacuum that has a few attachments such as a crevice tool and micro-cleaning tools is always the best bet. 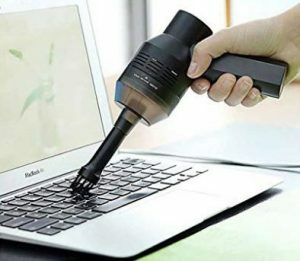 For sure, you don’t need a large, heavy machine to vacuum a computer or laptop. 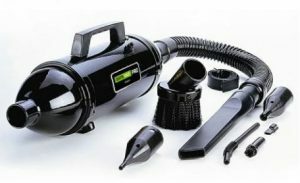 So, when looking for the best vacuum for PCs, you need to ensure that it is light enough to make the task easy. Also, you may choose to go for a small, handheld mini USB vacuum. These are especially ideal for cleaning laptops and keyboards. Also, the smaller the appliance, the easier it is to store. This is certainly one of the most important factors to consider when buying any item. Computer vacuums are no exception. Always ensure that you buy what you can actually afford. However, computer vacuums are usually cheap. Apart from the Metro Vacuum MDV-1BA which costs about $100, most PC vacuums will set you back less than $50. As with any other home appliance, a PC vacuum with sufficient warranty coverage should be a priority. Also, ensure that you read feedback from buyers who’ve had issues with a particular vacuum. This should give you a clear picture of how reliable the manufacturer’s customer service is. Dirt that piles up over time may cause damage to your computer. Apart from dust and other regular dirt, a lot of pathogens can be deposited on the computer, especially on keyboards. Failure to clean up may also result in allergic reactions or random illnesses. So, always keep your computer clean. The best vacuum for computers must not be the most expensive. You need to find one that strikes a balance between performance and cost. We have reviewed the top computer vacuums in the market to try and make the decision easier for you. Whichever you pick among these, you will have made the right choice.